Our story begins 25 years ago, when a bunch of guys were sitting around talking and came up with the idea that it would be fun to experience a grape harvest. Except these really weren't just "a bunch of guys." It was a couple of respected chefs and a wine steward, Emmanuel Kemiji. Well, one thing led to another and watching wine being made isn't the same thing as making it yourself. Since Emmanuel had a degree in viticulture from U.C. Davis, it made sense that he would run the show. Thus, Miura was born. Emmanuel also had degrees in Economics and Spanish Literature. One of his idols was a man named Eduardo Miura, who was the most famous bull breeder in Spain - ergo, the name and symbol of the winery. 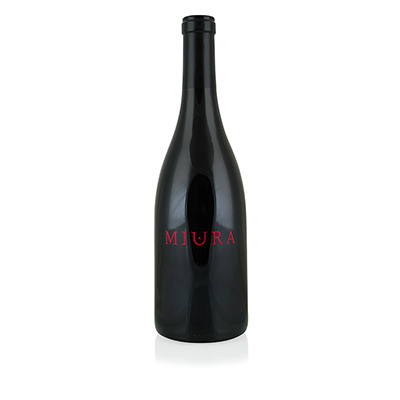 Fast forward to today, and Miura now farms its own vineyards in the Santa Lucia Highlands, one of the most prestigious regions for Pinot Noir in California. It's a very small appellation covering only 6,300 acres, yet more than half of that is planted to Pinot Noir. The reason is obvious. The Pinot Noir produced here is like no other. It has more flavor, depth and character than most Pinots grown anywhere else. It also sports tremendous balance, as the flavors carry from the beginning, through the middle, and on to the grand and glorious finish. And oh those flavors! Cherry, cotton candy and mint are just the beginning. But, that beginning transforms into a stunning middle and an amazing ending.